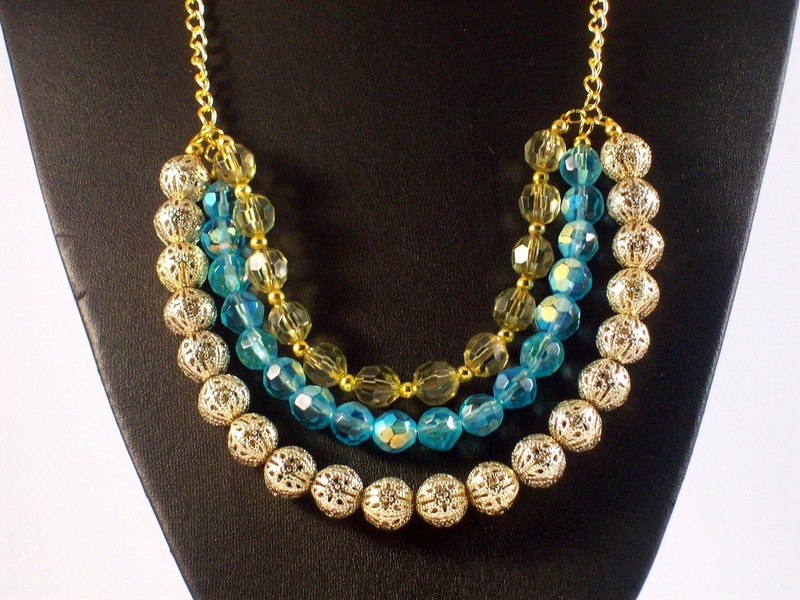 Michelle's Handcrafting Blog: What to do with leftover beads? I've got a plastic bead container on my workdesk and whenever I finish a project, I pop the leftover beads into it. Sometimes I buy beads in bulk, it all depends on what I'm making, but generally I buy only the beads I need. I hate to waste things, so unless you've planned to make several projects with your stash of beads, those leftover beads are just going to sit there. Well, last weekend was my mother-in laws 70th birthday lunch. I had the outfit, black dress, jacket and heels. 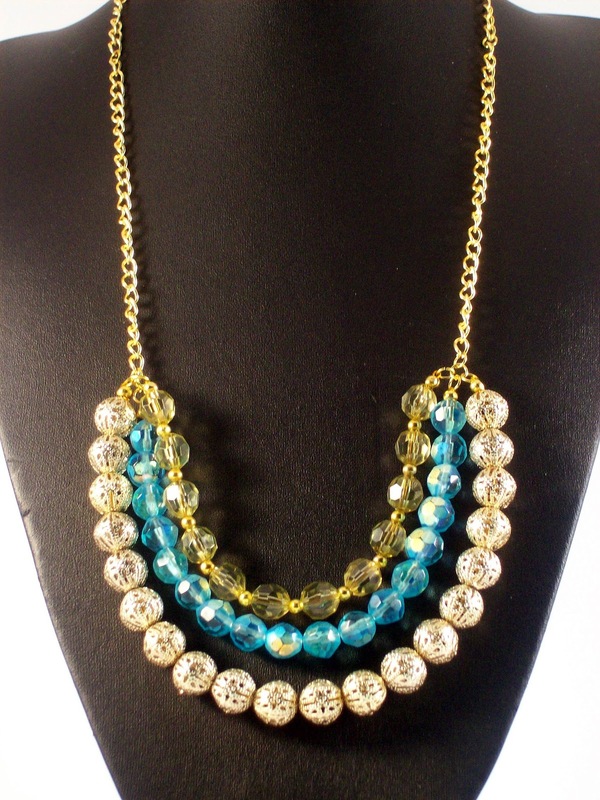 I wanted to make a necklace with a bit of colour and sparkle, to brighten up my outfit. 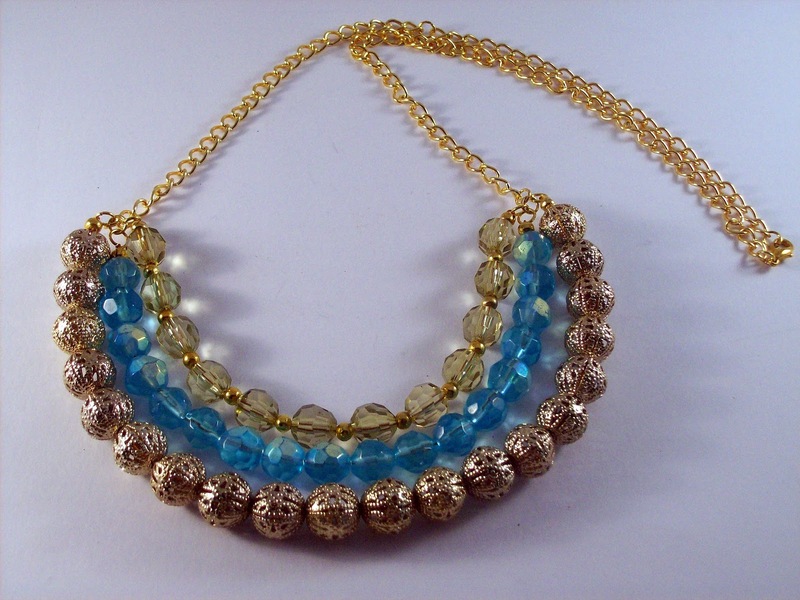 I went to my spare bead container and choose a selection of yellow glass beads, blue AB faceted beads and also added some gold filigree beads and some gold plated chain. I always think the colour gold is a strong contrast against the colour black. I got to work, I wanted to make a statement necklace, I had an idea how I wanted it to look and I'm pleased to say, it turned out exactly how I thought it would. My necklace received lots of compliments and I love the way it drapes when I am wearing it. I've talked about my leftover beads, but I know all you crafters out there must have leftover supplies from a project you have completed, whether it be fabric, card e.t.c. Drop me a line and let me know how you made use of what you had spare, I'd love to know. Beautiful, amazing what you can do with leftovers!